Move Apple seedlings into pots. 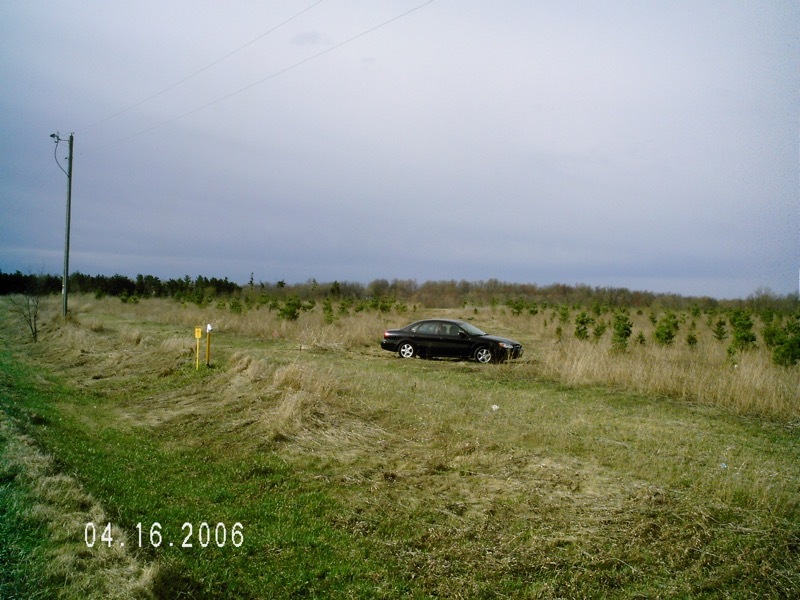 Continue release efforts for pine and hardwood transplants from previous years and monitor efforts to keep deer off. 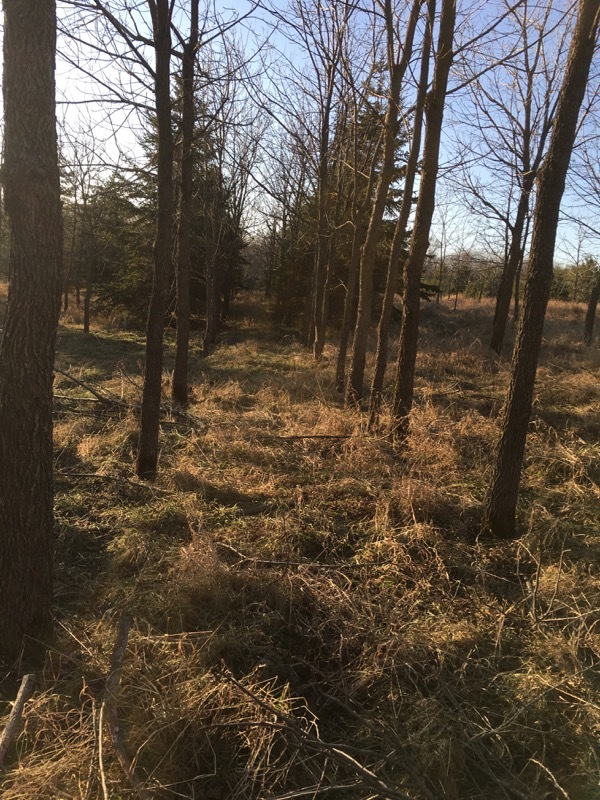 Continue pruning and brushing in wood-lot. 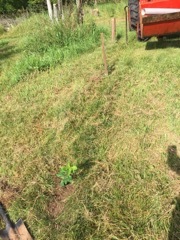 Begin release efforts for young hardwood rows planted between the pine rows. 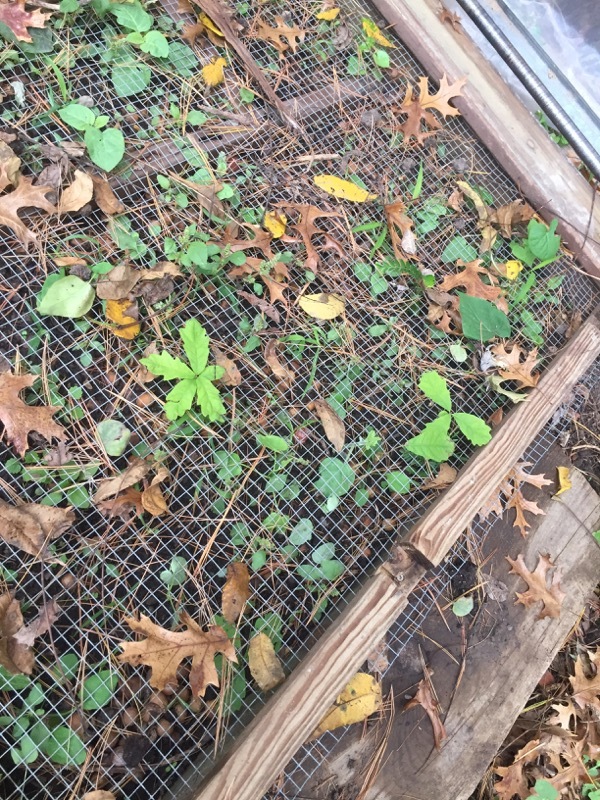 Experiment with removing entire pine rows between hardwood rows. Collect seed and prepare seed beds (in Madison and Centuria). 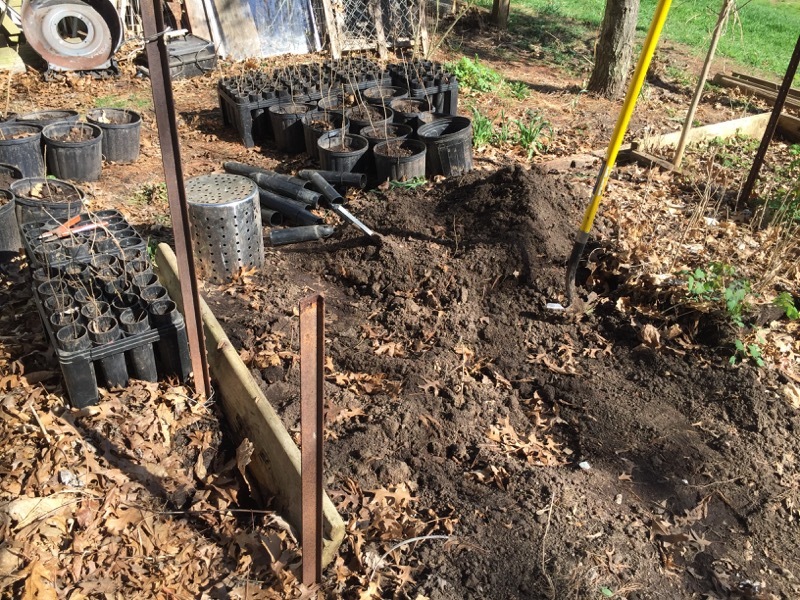 Transfer potted Oak trees to Centuria and begin planting and screening trees in gaps in wood lot. 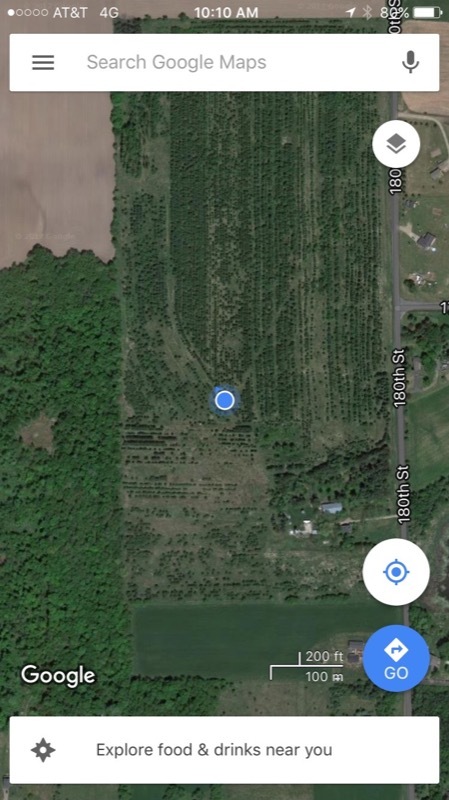 Begin Using GPS (via Google Maps) to document location of work in woodlot. 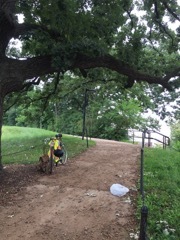 Transplant second half of Oak seedbed in Madison. The season was early this spring (2017) so I didn't want to wait for the HS Softball season to get over to transplant these trees to the farm. I also didn't want to leave them where they are for a 3d summer of growth in such a crowded space. I would lose many more trees to competition. The solution is to move the trees out of the bed into either a pot or a larger spot in the garden. 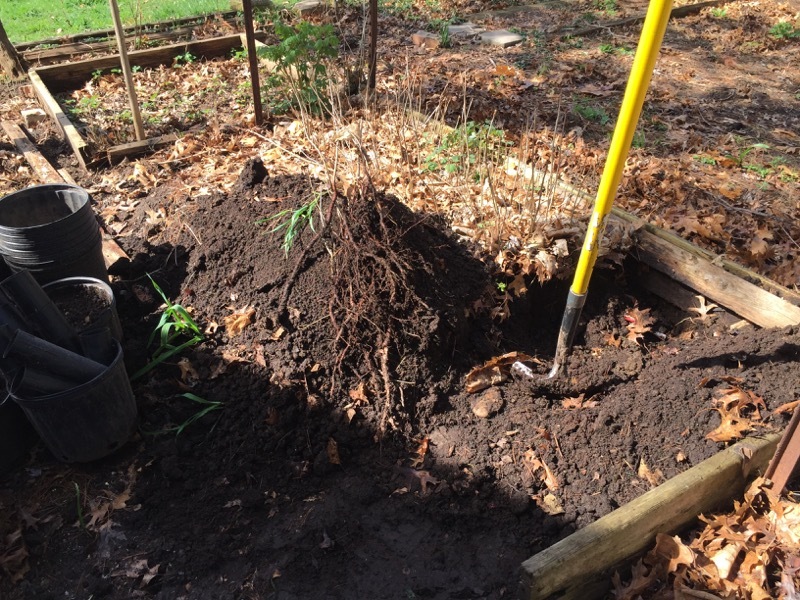 There is always some damage to the roots with this kind of process so this will give the young trees a chance to re-grow the root system in a gentle, non-competitive environment before they are thrown to the 'wolves' (weeds, deer, mice, grass, etc.) at the farm. Apple trees have been part of our family since before I can remember. My parents always had an orchard. Most of my siblings have had orchards both large and small. Most of these trees were of commercial varieties but many were grown from seed. ( As you probably know all popular/commercial varieties are clones of one original tree of that variety. An apple seed does not produce copy of the apple variety it came from. One of the trees my Mother grew turned out to be good enough to patent and it is raised in commercial orchards. 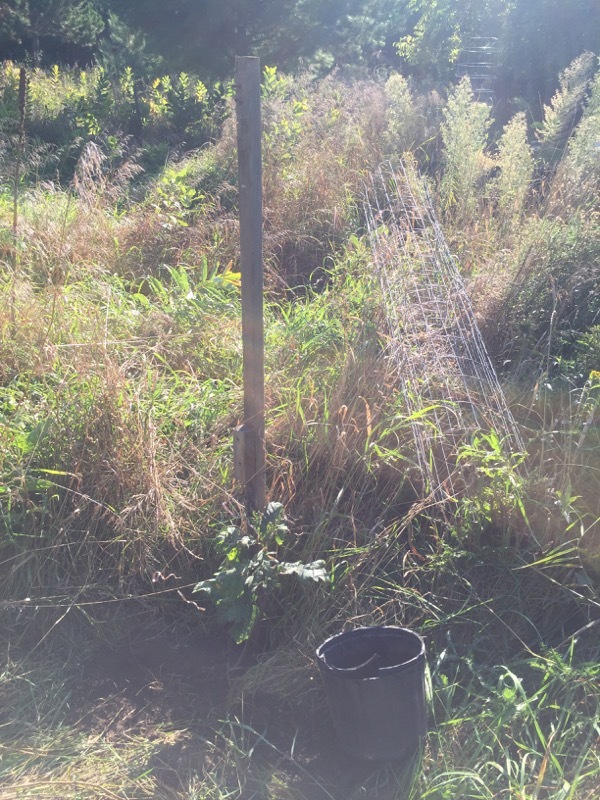 In the process of re-foresting our farm I have grown 1000's of trees from seed; Oak, Walnut, Maple, Ash, Spruce, Pine, Poplar 'sticks', Honey Locust, Hickory, Buckeye, etc. But never an Apple. Last fall I collected some seed from some apples we picked at a local orchard. I wrapped them in some damp paper towel and sealed them in a baggies. I put this into our refrigerator and this past week I opened it to check for sprouting. 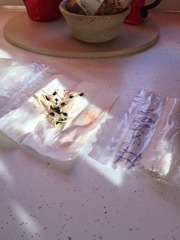 Nearly all the seeds had sprouted so I carefully detached each one from the towel and put them in a transplant flat. 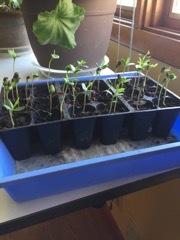 After about a week they are doing nicely and have fully developed seed leaves. 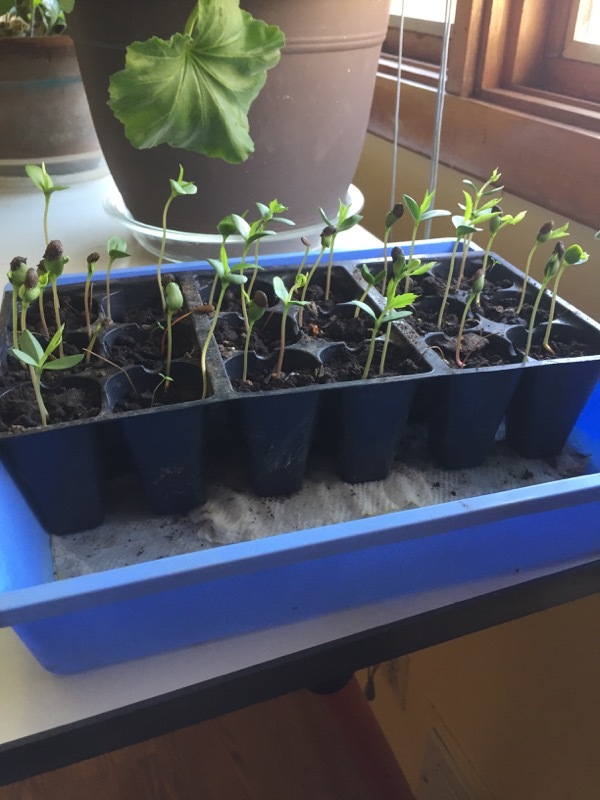 These seedlings prospered for a couple weeks and then they all died. I think they damped off. Maybe I didn't clean the pots well enough or sterilize the soil. Fortunately, last fall I put another bunch more seeds in a pot and buried it in the compost pile (outside, of course) to stratify these seeds naturally. This spring these seeds sprouted and survived nicely. Now I am transplanting them out of their original 'group' pot into individual D80 pots. I have nearly 30. I hope these fare better than their indoor counterparts. Fill in gaps in plantation with oak seedlings. 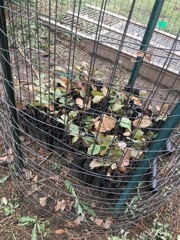 These transplant Oak trees were dug from my seedbed this past spring, and potted in 8" pots with compost. 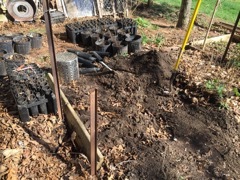 They were cared for all summer and now they are transplanted. These trees have three (3) summers' growth from acorn. This is older than I usually move trees. I believe the most traumatic part of waiting this long is the initial dig from the bed (this severs the long tap-root) so I potted them this spring to give them a summer to recover this initial shock before putting them in the wild. August 2017: It's nut picking time again. 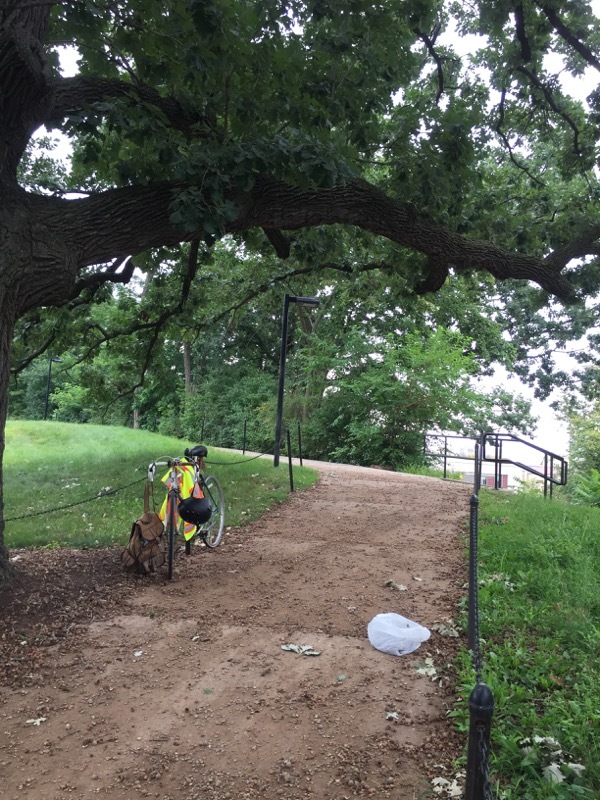 August 21, 2017: UW Campus Burr Oak are in full drop mode. (These trees usually drop nuts about the time students are moving in for the fall semester - which will be next weekend). I collected about 10 pounds from the trees behind Ag Hall (on top of the hill). 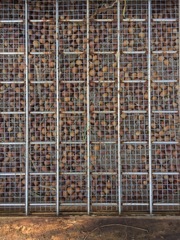 Burr Oak acorns are quite small so this amounts to a lot of seed - probably all I'll need from the White Oak family this year. August 25, 2017: It's still a bit early for Red Oak acorns. There are a few green nuts on the ground but the squirrels are rushing the season and they tend to have fumble fingers while foraging in the trees. Shag-bark Hickory are loaded this year but have only begun to drop. Again the squirrels have taken the lead. This year I have taken greater care in building my seed bed. The sides need to be buried at least 4" so the animals cannot (will not ) burrow under. Screen is fastened securely; first with staples then with boards. Support - cross-pieces - within the bed to keep screening from sagging (see #2). 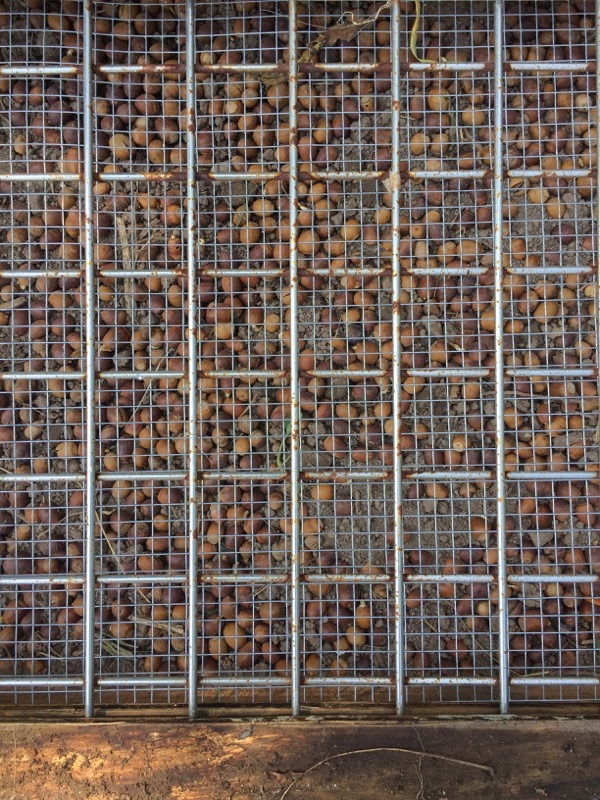 This year I gathered Oak seed from the University of Wisconsin and Warner Park in Madison, Wisconsin. 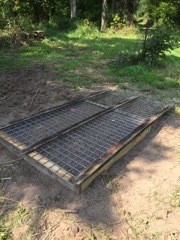 Seedling frame ready for screen cover. White Oak tap roots breaking out of the acorn (left). 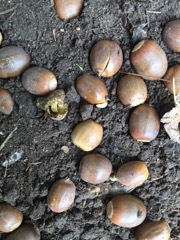 The white oak acorns start growing as soon as they hit the ground. 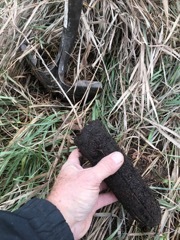 They send out a tap root and care is taken not to break this when collecting the nuts and handling them while placing them in the seedbed. 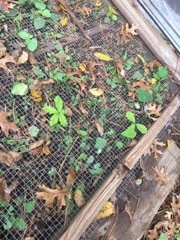 Already in October, these two little trees have already sprouted through the screen which covers my seed bed. Maybe because we haven't had a frost yet in Southern Wisconsin. If you take a close look at this picture you will see some of the competition a new tree faces as it starts it's life. (It's only been a couple weeks since this was bare ground). I think that anything a tree can do to get an advantage over these 'weeds' will give it a leg up. With most plants, the first one to the sun usually wins (ie. survives). 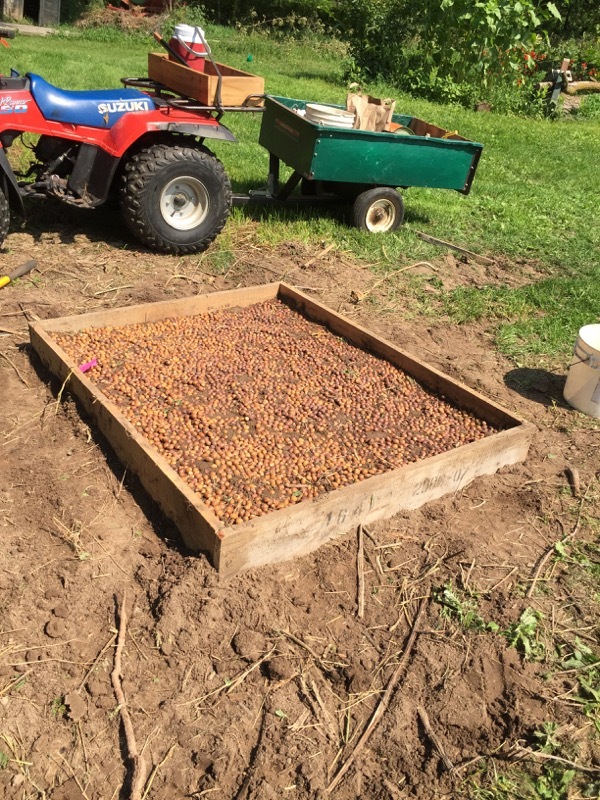 This is the first year for a seed-bed in Centuria. 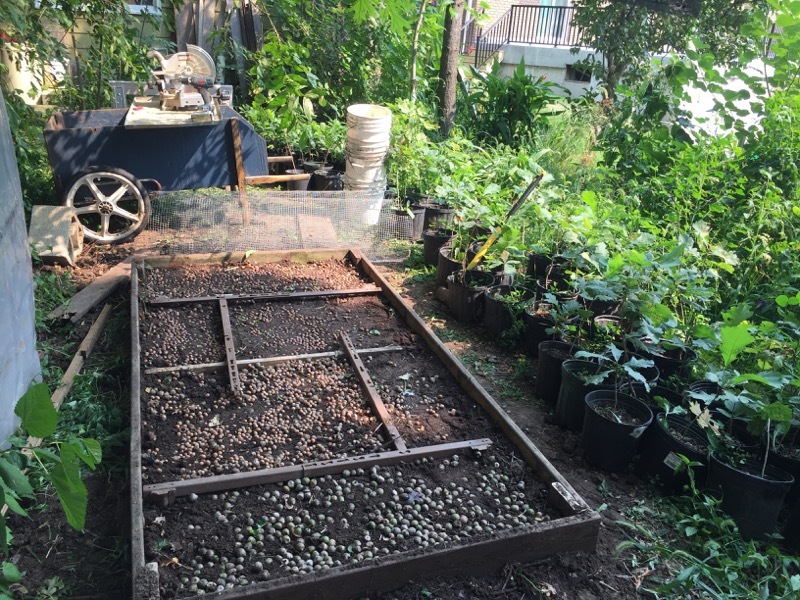 I had help this year in collecting nuts so I had more than I could fit into my little garden in Madison. Why not? 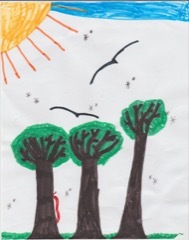 It makes perfect sense when you think that Centuria is where these trees are ultimately going to be grown. It's easier and cheaper to haul up a couple pickle pails of nuts than a couple hundred potted trees he 300 miles from Madison to Centuria. 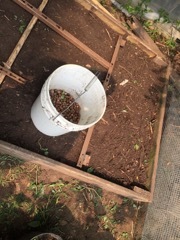 I expect squirrels and chipmunks and mice to try to get into these beds - both in Madison and in Centuria. In Centuria I would also guess that some larger animals would also like some nice nuts to eat. These Deer, Turkeys, Bear, etc. could probably easily get through the 1/2" mesh screening I use in Madison. Even if they weren't able to get through, they could do enough damage to open things up for the little guys. The big screens were longer than the bed frame so they are hanging over on the far end. I hope some big animal doesn't use this a leverage. Here is how the bed looks through these two screens. Remember: you can click on these pictures to view a larger version. 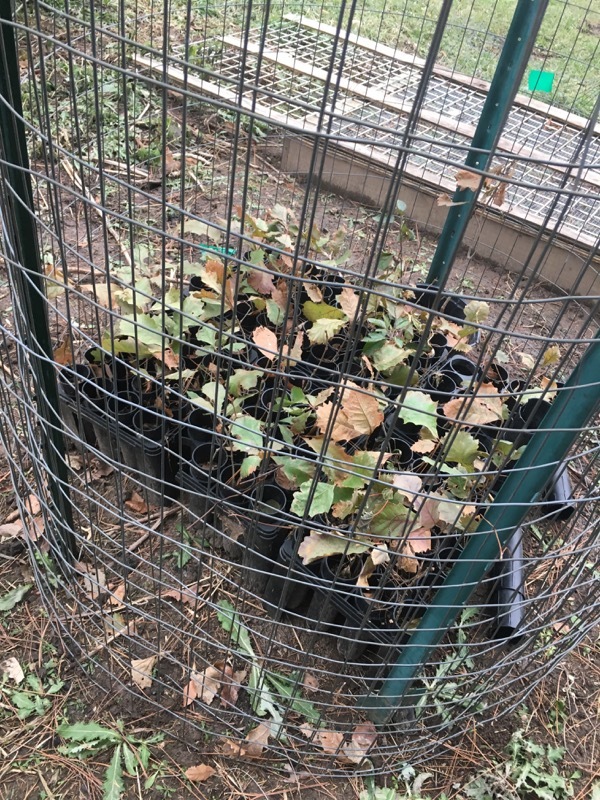 Transplant Oak seedlings and set up cages. 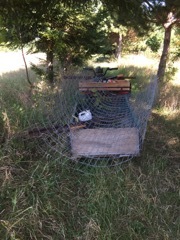 Many of the trees that I have previously caged have grown above deer browse so the screens are no longer necessary. This is a convenient time to do some shaping of the newly freed trees. 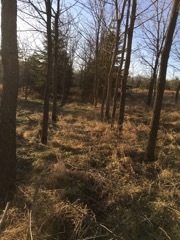 Keep in mind when pruning lower branches on young hardwood trees that these thin trunks are a perfect size for bucks to use to rub off the fuzz on their new horns. This deer rub will usually break off the young tree or, at least girdle it to a point that it must be lopped off. One thing you can do to discourage this behavior is hang newly cut branches down from upper branches to camouflage the trunk of the tree enough so the bucks will not recognize it for what it is and pass it by. 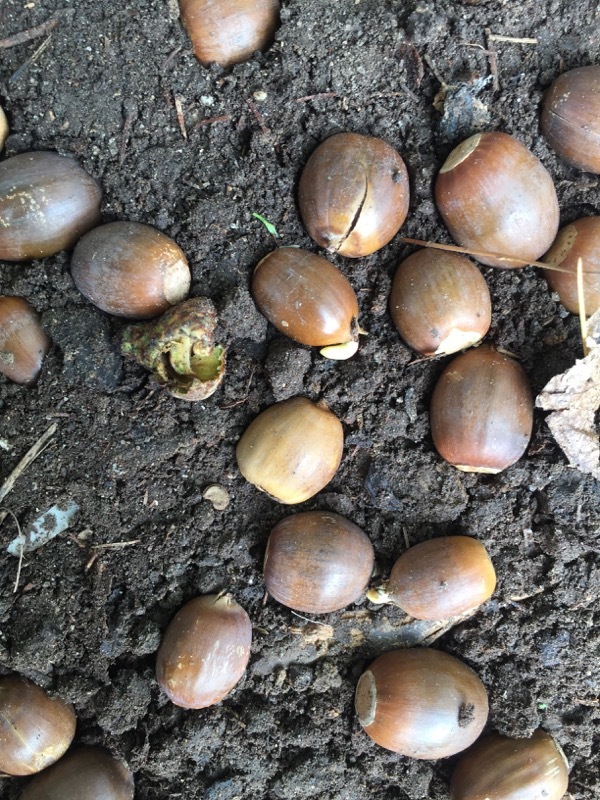 I have known that White Oak acorns will sprout there tap root almost as soon as they hit the ground but I've never seen them grow a tree before snow fall -- until this year. A Sad Tale (or) you can never be too careful. 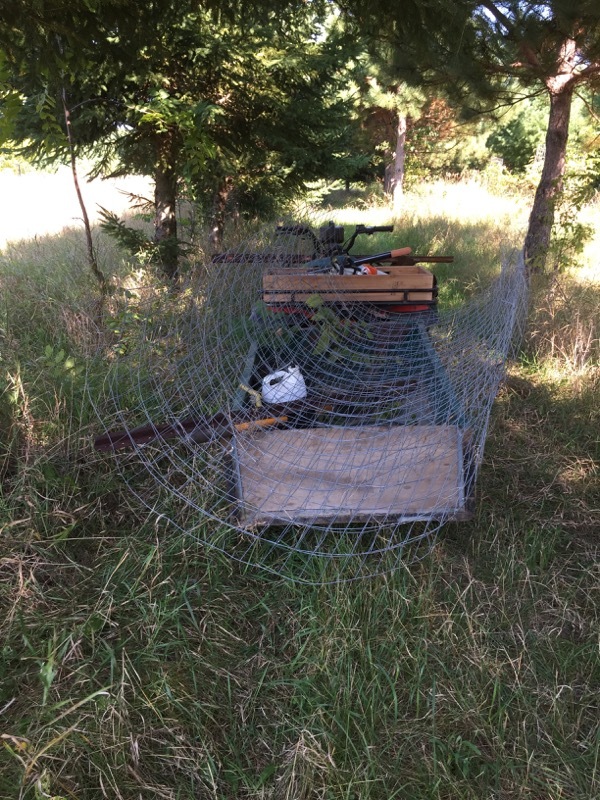 Last year I was careless in setting up my nursury frame and the critters got all the nuts. This year I took great care in setting the frame and sealing it to keep out the rodents. 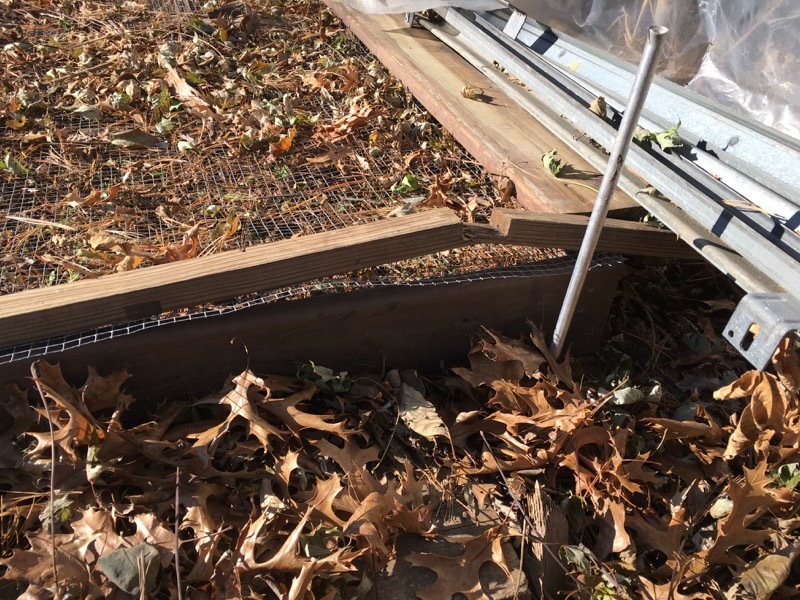 I even used strips of wood screwed to the frame to doubly secure the screen. Everything was tight and secure except I had carelessly left one of the wood strips extending past the corner of the frame. What could go wrong? I needed to store some track sections from the old garage door and next to the frame was a nice out of the way place. I didn't notice they were resting on this extended piece and they proved to be too heavy for it to hold. The break didn't come at the end of the frame but a foot inward of the edge. 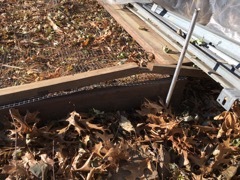 This levered up and allowed the screen to loosen from the frame just enough for some rodent to get inside. By the time I saw this my whole seed bed had been sacked. About 90% of the nuts are gone. I'd imagine the remaining 10% are bad. Thank goodness I have an intact frame at the farm - knock on wood. November 2017: Late season week at farm. High Pruning The Walnut Stand (Five Mile Plantation). First 'top down' pruning of 'five mile' walnut stand. Foresters say when you are prunning hardwoods for lumber to look up. Pay close attention to the top of the tree because where the leader grows, so grows the tree. The oldest stand of Walnuts on our farm has been pruned up from the bottom; 3 or 4 years ago. On this trip I borrowed a pole saw so I could start attending to the tops. My primary aim is to remove any close crotches and establish a leader. Care must be taken not to take off too many of the side branches so as to distroy 'the factory'. I also don't want to re-open the canopy which has nearly closed in this stand which kills off the grass around the trees. Grass is the main competetition for reasouces (water and nutrients) for these trees. 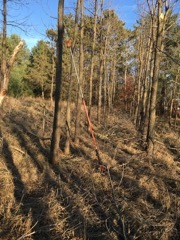 There are a few trees that are tall enough where I could prune off side branches as high as I could reach with this pole saw. (it has a 9' shaft) This insures at least one whole 8' saw log. I don't like leaving potted (tree-tube) trees exposed through the winter. The pots don't provide the roots with enough protection against the frost (or perhaps the freezing/thawing cycles). 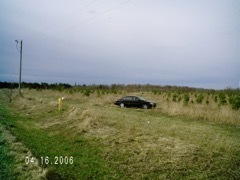 When I put these potted Oak trees at the farm I had planned to cover them in straw or something. I forgot. 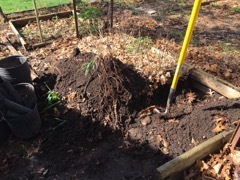 I learned that my brother was trapping gophers so I though "if he can do that I can transplant trees." 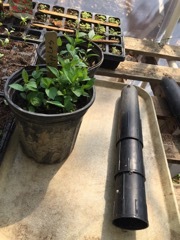 Even though the potted trees were frozen solid, the warm sun warmed the sides of the pots enough that the rootball could be knocked out (without breaking the pot). 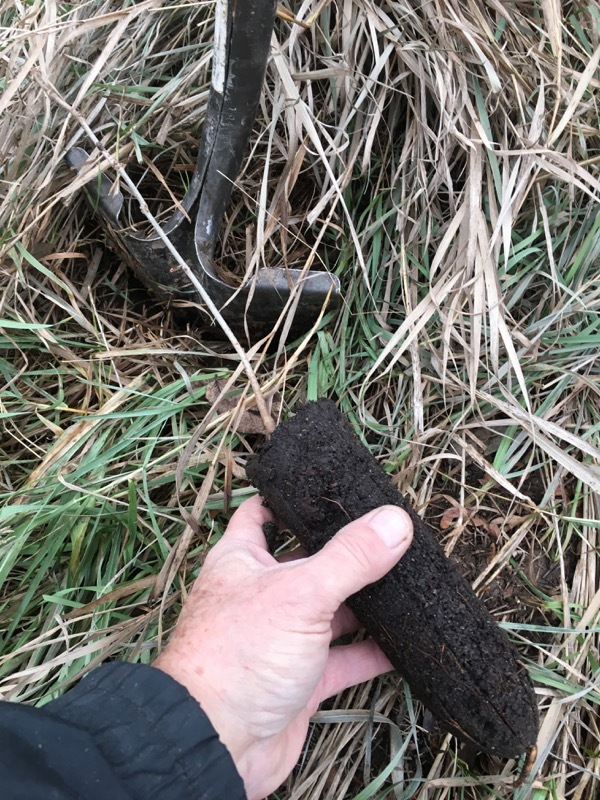 The top inch of teh soil was frozen but once you cut through that it is easy enough to make a hole that you can 'drive' the root ball into. 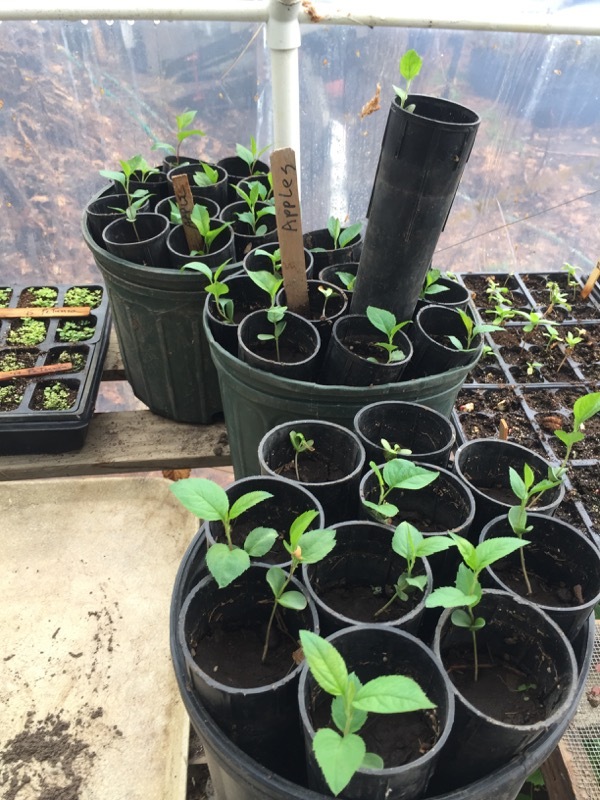 I am careful to flag each new seedling so that I can find it next spring and somehow protect it from the grass, rodents and perhaps the deer. 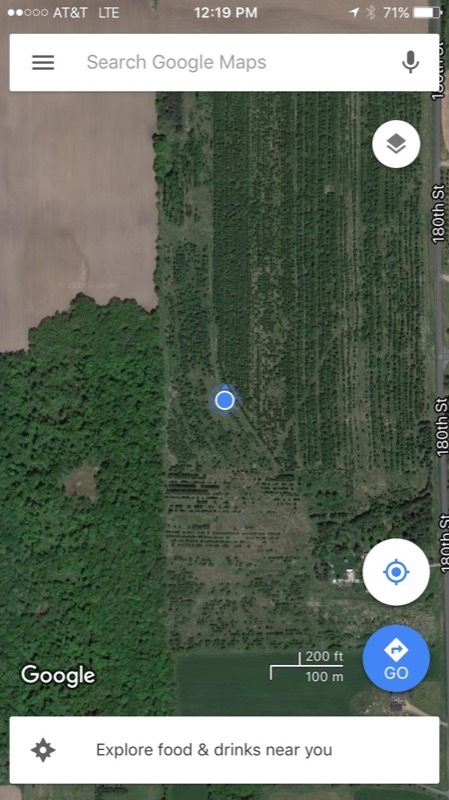 Location: I am filling in gaps in the hillside Walnut plantation (five-mile) east of the gravel pit. This is not the best soil (gravel and clay) whaere the Walnut are not doing very well. Gas Company Clears Pipeline Right-Of-Way. Cleared pipeline : (Left 2017) (Right 2006) - notice how much the trees have grown. Northern Natural Gas company has a pipeline that runs diagonally accross our property. This was installed back in the 1960's when my father sold them the right-of-way. Selling this land seemed to be a good deal back then because this was crop land and he could still use this land to raise crops. And he used the money he got for the land to pay for a new silo (which was much needed at the time). There didn't seem to be a down side and he was doing his civic duty by allowing the gas to flow for the greater good. 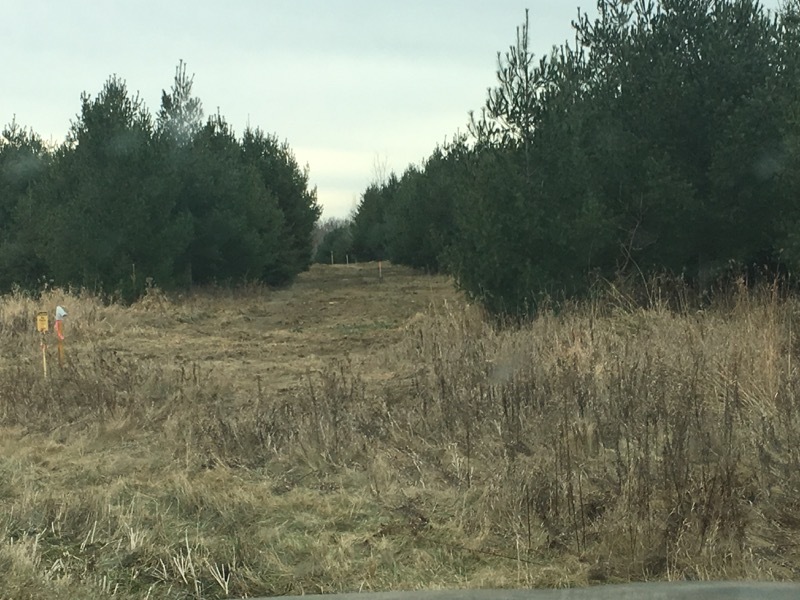 Fast forward 50 years and now the gas company owns a 50 foot wide stip of land that cuts though my woodlot. Every ten years they come through and clear a 25 foot wide strip down the center of this right of way. It doesn't matter if I have a 'crop' growing or not. 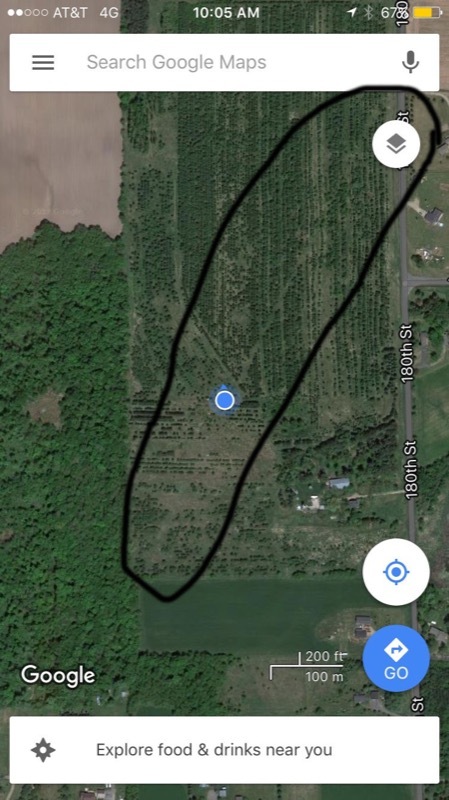 This ariel view shows the path of the pipeline across our farm. This was taken before the 2017 clearing so it is rather faint so I've circled it in black. As you see it nearly transects the entire farm. Nearly 3000 feet of my cropland that I cannot plant into crops. This used to bother me -- a lot -- until I realized that my trees were getting to the point where I would soon have to do a thinning. 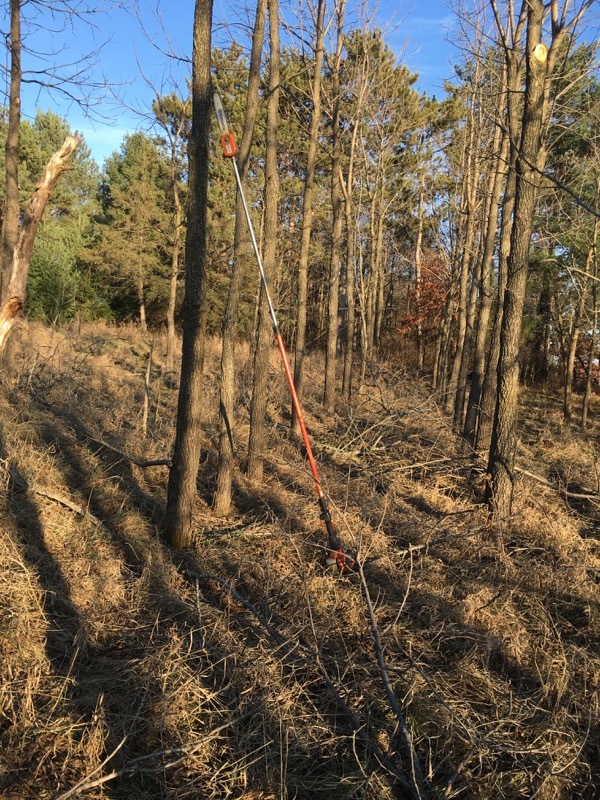 Loggers would need access to the rows in order to remove the logs. The gas company has cut me a very nice road. It's not in a pervect place but it comes close. And they come through every 10 years to maintain it.